The party cannot endure another leadership campaign. True, the skirmish between PC leadership candidates (he’s an idiot, no she’s an idiot) would present the Opposition with useful fodder to bludgeon the PC government over the remaining two years of their term. There are no credible leadership alternatives. Not true. 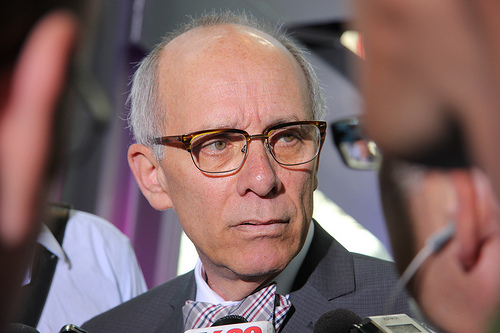 There are a number of credible leadership candidates starting with former Edmonton mayor Stephen Mandel and ending with the (less credible) premier-in-waiting, Thomas Lucaszuk. So why hasn’t one of these potential candidates presented himself/herself for consideration? The Wikipedia factor: Only an idiot would wrest the steering wheel from Ms Redford as she drives her party over the cliff. Who would risk going down in history as the second Harry Strom, leader of the Social Credit, a party that had been in power for 36 years before being erased from the political landscape by Peter Lougheed. The PC party may in disarray but its members are nothing if not practical. So brace yourselves for two more years with Ms Redford at the wheel. It’s going to be a very bumpy ride. This entry was posted in Politics and Government, Uncategorized and tagged 2013 Leadership Review, Lukaszuk, Redford. Bookmark the permalink. I had no idea that Stephen Mandell was still interested in politics and much less that he had joined Ayn Rand’s club. Always something new. I just read that Alison Redford had 77% approval rating. Danielle Smith must be celebrating at home. They just lost the next election. I did not know there are so many weirdos in the PC party. I wished I could hibernate. It is going to be a miserable ride indeed. Hopefully by 2015 none of the oil companies’ CEO is our ‘de facto’ deputy premier. 77% eh? A friend in the Wildrose party predicted an approval rating in the 70’s and that Ms Redford will follow in the footsteps of Mr Stelmach and be gone in 2014. I hope that’s right, but I agree with you, the longer the WR can keep Redford in office the better they’ll do come election day. If nothing else we’ll have a lot to talk about over the next two years! Had to stop for a moment, since I do not know who Harry Strom was, but got the point! Thank God that politics is kind of like the seasons. They come and they go. However, unlike the seasons, we have the power to change politicians!! !